DBISAM 4.45 Build 2 is now available for download. If you're an existing customer, then you should be receiving an email shortly with download instructions. 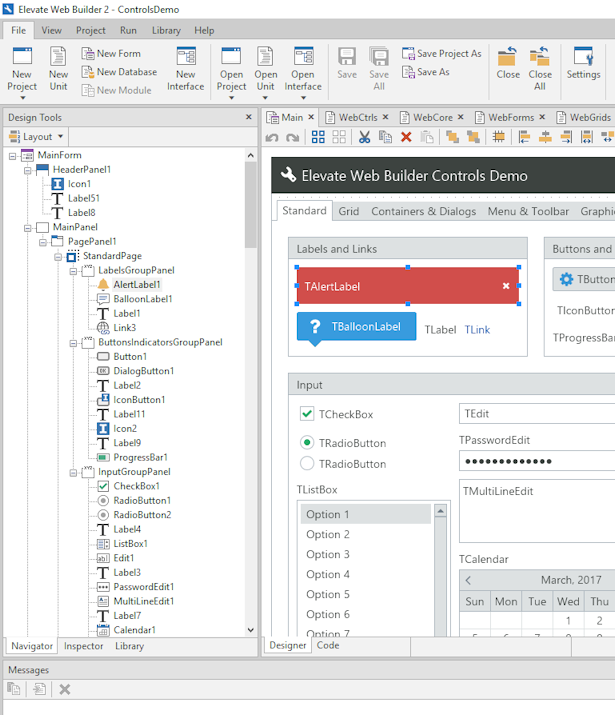 Elevate Web Builder 2.06 Build 12 is now available for download. If you're an existing customer, then you should be receiving an email shortly with download instructions. This build contains several bug fixes, which are detailed here. ElevateDB 2.28 is now available for download. If you're an existing customer, then you should be receiving an email shortly with download instructions. These are published properties, so please be sure to open, ignore any warnings about these properties being absent, and re-save any forms or data modules that use the TEDBEngine or TEDBSession components to ensure that you do not see any runtime missing property errors in your application(s). If you are using local ElevateDB sessions to directly access shared databases on a file server, you need to make sure that all client applications that are accessing the data are either updated to 2.28 or have their pre-2.28 TDBISAMEngine LargeFileSupport and/or LocalLargeFileSupport properties set to True. Failure to do so can cause the local ElevateDB sessions to not see each other's locks, which can lead to database corruption. There is a new CURRENT_SESSIONID function for returning the current session ID in SQL/PSM routines. Large file support is now enabled by default in ElevateDB. Along with this change, the LARGEFILESUPPORT connection attribute has been removed. If you are using local ElevateDB sessions to directly access shared databases on a file server, you need to make sure that all client applications that are accessing the data are either updated to 2.28 or have their pre-2.28 LARGEFILESUPPORT connection attributes set to True. Failure to do so can cause the local ElevateDB sessions to not see each other's locks, which can lead to database corruption. ElevateDB now includes new global buffered file I/O functionality. Please see the Buffering and Caching topic in the SQL manual for more information. ElevateDB now includes new SQL statement and function/procedure caching functionality. There are new STMTCACHESIZE and PROCCACHESIZE connection attributes for configuring the caching, as well as the EDBConnection FreeCachedStatements and FreeCachedProcedures methods for freeing cached SQL statements and functions/procedures in the ElevateDB .NET Data Provider (there are no equivalents for the ElevateDB ODBC Driver. Please see the Buffering and Caching topic in the SQL manual for more information. ElevateDB now includes new SQL statement and function/procedure caching functionality. There are new STMTCACHESIZE and PROCCACHESIZE connection attributes for configuring the caching, as well as the edb_freecachedstmts and edb_freecachedprocs functions for freeing cached SQL statements and functions/procedures. Please see the Buffering and Caching topic in the SQL manual for more information. DBISAM 4.45 is now available for download. If you're an existing customer, then you should be receiving an email shortly with download instructions. The TDBISAMEngine LargeFileSupport property has been removed and large file support is now always on. This functionality has its roots in the old Windows 9x series of operating systems and is no longer relevant. If you are using local DBISAM sessions to directly access shared databases on a file server, you need to make sure that all client applications that are accessing the data are either updated to 4.45 or have their pre-4.45 TDBISAMEngine LargeFileSupport property set to True. Failure to do so can cause the local DBISAM sessions to not see each other's locks, which can lead to database table corruption. The TDBISAMSession PrivateDir property has been changed from being a published property to a public property, so you may see a missing property error when loading forms or data modules in the IDE that contain the TDBISAMSession component after updating to 4.45. This property is typically only useful at run-time, and setting it at design-time could cause run-time errors if its value did not work properly with the target operating system's configuration. To make sure that you don't experience any "missing property" exceptions at run-time in your application, please open any forms or data modules in your application that contain an existing TDBISAMSession component at design-time, ignore any "missing property" errors, and then re-save the owner form(s) or data module(s) that contain the TDBISAMSession component(s). The TDBISAMEngine TableReadLockRetryCount, TableReadLockWaitTime, TableTransLockRetryCount, TableTransLockWaitTime, TableWriteLockRetryCount, and TableWriteLockWaitTime properties have been replaced with the equivalent TableReadLockTimeout, TableTransLockTimeout, and TableWriteLockTimeout properties. To make sure that you don't experience any "missing property" exceptions at run-time in your application, please open any forms or data modules in your application that contain an existing TDBISAMEngine component at design-time, ignore any "missing property" errors, and then re-save the owner form(s) or data module(s) that contain the TDBISAMEngine component. The SQL join performance has been improved by up to 30-40%, depending upon how join-intensive the SQL being executed is. For example, SQL SELECT statements that contain INNER JOINs but no WHERE clauses are very join-intensive, and will benefit the most from this performance improvement. The internal bitmap set handling for filters and SQL has been changed so that DBISAM uses sparse bitmaps instead of linear bitmaps, resulting in faster performance and less memory consumption. Part of the join performance improvements mentioned previously are due to the use of the new sparse bitmaps. The sockets functionality in the DBISAM engine has been replaced with a new implementation, which should result in better overall performance and stability for remote sessions and the database server. There is a new NOWHEREJOINS clause available for the SQL SELECT, UPDATE, and DELETE statements. This clause allows you to prevent DBISAM from treating any inner joins in the WHERE clause (SQL-89-style joins) as optimized joins, instead allowing the expressions to be treated as un-optimized expressions that will be evaluated after any joins are executed. There are new TDBISAMEngine StoreActive, TDBISAMSession StoreActive, TDBISAMDatabase StoreConnected, TDBISAMTable StoreActive, and TDBISAMQuery StoreActive properties for specifying whether the component's related Active and Connected properties are stored in the owner form or data module. The large file support driver configuration option has been removed and large file support is now always on. This functionality has its roots in the old Windows 9x series of operating systems and is no longer relevant. If you are using local DBISAM ODBC Driver connections to directly access shared databases on a file server, you need to make sure that all client applications that are accessing the data are either updated to use the 4.45 DBISAM ODBC Driver or turn on the pre-4.45 large file support driver configuration option turned on by using the ODBC Driver Configuration Utility that is included with the DBISAM ODBC Driver installation. Failure to do so can cause the local DBISAM sessions to not see each other's locks, which can lead to database table corruption. The DBISAM ODBC Driver Table Read Lock Retry Count, Table Read Lock Wait Time, Table Transaction Lock Retry Count, Table Transaction Lock Wait Time, Table Write Lock Retry Count, and Table Write Lock Wait Time driver configuration options have been replaced with Table Read Lock Timeout, Table Transaction Lock Timeout, and Table Write Lock Timeout configuration options. These options can be modified using the ODBC Driver Configuration Utility that is included with the DBISAM ODBC Driver installation. ElevateDB 2.27 is now available for download. If you're an existing customer, then you should be receiving an email shortly with download instructions. The XML output from the EXPORT TABLE SQL statement now includes a top-level "table" element in order to properly adhere to the XML specifications and allow exported XML files to be properly validated. The IMPORT TABLE SQL statement can still import XML files formatted with or without the top-level "table" element. and the query will return all rows where the TimeStampColumn column contains a timestamp value whose date portion matches the specified date constant value. default expressions for DECLARE SQL/PSM statements were previously not being type-checked properly, so you may see new type errors during compilation of routines that do not specify correct default expressions for a given variable type. New VCL TEDBDataSet Import and Export methods have been added to allow for the import/export of files to/from TEDBTable, TEDBQuery, TEDBScript, and TEDBStoredProc components. A new LOG EVENT SQL/PSM statement has been added in order to allow SQL/PSM routines (scripts, procedures/functions, triggers, and jobs) to log information, warning, and error events directly to the logged events for the current ElevateDB configuration. There are new VCL TEDBEngine AddDayTimeToDateTime, AddDayTimeToTime, AddYearMonthToDate, AddYearMonthToDateTime, SubtractDateFromDateAsDayTime, SubtractDateFromDateAsYearMonth, SubtractDateTimeFromDateTimeAsDayTime, SubtractDayTimeFromDateTime, SubtractDayTimeFromTime, SubtractTimeFromTimeAsDayTime, SubtractYearMonthFromDate, and SubtractYearMonthFromDateTime methods that allow for basic interval math directly from native code, in addition to SQL. As noted above in the breaking changes section, you can now directly compare the date portion of timestamp values with date values. ElevateDB now logs warning events to the logged events for the current ElevateDB configuration when a database is opened and the database path does not exist, or if the database catalog does not exist. The ALTER INDEX and ALTER TEXT INDEX SQL statements no longer alter the entire index when only the description is changed.